In late 2016 the art in the window series showcased individual pieces of art in-between pop-up shops. The shop window became a single-piece gallery. Art work from around the world as well as down the street was showcased. This ended when the pop up gallery project ended. Published in an edition size of 225 the serigraph is printed in 26 colours on paper and is hand signed in English in pencil lower right. Edition number is in pencil lower left. M.F. Husain (1915 – 2011) the master of modern Indian paining and whose place in art history is unquestionable. 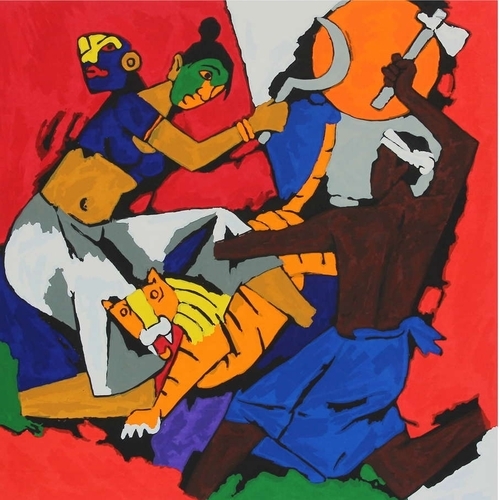 Husain was largely instrumental in making a market for Indian contemporary art in the global art scene. As you see more of Husain's work you learn that the style he developed is the figurative floats and each one of them has a story to tell. His work is poetic and the stories in them are epic narrations and a collage of story boards which you want to discover as you stand there mesmerized by his work. One of the oldest forms of print-making, serigraphy or silk-screen painting, involves creating a separate screen for each colour, in this case 26 individual colours. Each silk screen is precisely placed over the serigraph paper, and then by hand squeegee paint for a specific colour is applied. It can take a serographer up to six months to produce a run of the same image. They are costly to produce and as close to the actual original painting as you can possibly get. “A print is for people with more taste than money.”—M. F. Husain. Victor Brockdorff (1911 – 1992) was a Danish painter and student at the The Royal Danish Academy of Fine Arts from 1931-1934. He debuted at the Autumn Art Exhibition at Den Frie Centre of Contemporary Art in 1932. In the same year Brockdorff co-founded the Corner artists' association, which today it is the second largest artists association in Denmark. His surrealist experiments in the 1930s were inspired by his friends and fellow Danish artists, Adam Fischer a sculptor and an early contributor of works inspired by Cubism and Georg Jacobsen a bricklayer turned architect, artist and theorist. Jacobsen worked with the Mexican painter Diego Rivera and contributed to Brockdorff’s period of socialist realism, initiated during his long stay in Paris. Brockdorff's interest was in painting city scenes and his style evolved from Modernism to Realism. He developed a functionalist-inspired painting of figures in spaces to become a significant interpreter of the human form in the environment, both in the physical, as in the political and cultural sense. His many landscapes reflected his joy in light and lushness of nature and were marked by a penchant for clear local colours and a bright light, often with a bluish tinge. The driving force behind these everyday depictions was Brockdorff’s social commitment. He was also an accomplished portrait painter. Works by Victor Brockdorff are included in museums in Vejle, Esbjerg and Aarhus and Statens Museum for Kunst the National Gallery of Denmark.